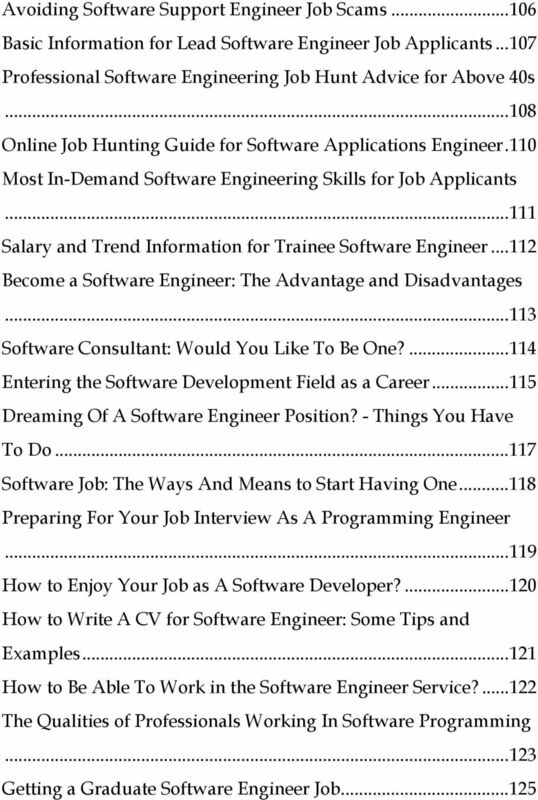 Download "The Software Engineer Career Guide"
2 The Software Engineer Career Guide Copyright 2009 Notice of rights All rights reserved. No part of this book may be reproduced or transmitted in any form by any means, electronic, mechanical, photocopying, recording, or otherwise, without the prior written permission of the publisher. Notice of Liability The information in this book is distributed on an As Is basis without warranty. While every precaution has been taken in the preparation of the book, neither the author nor the publisher shall have any liability to any person or entity with respect to any loss or damage caused or alleged to be caused directly or indirectly by the instructions contained in this book or by the products described in it. Trademarks Many of the designations used by manufacturers and sellers to distinguish their products are claimed as trademarks. 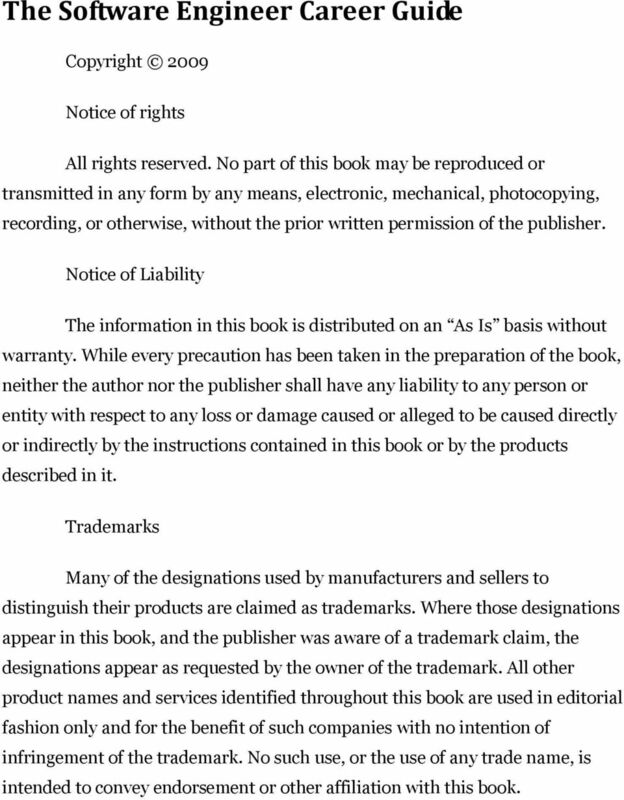 Where those designations appear in this book, and the publisher was aware of a trademark claim, the designations appear as requested by the owner of the trademark. All other product names and services identified throughout this book are used in editorial fashion only and for the benefit of such companies with no intention of infringement of the trademark. No such use, or the use of any trade name, is intended to convey endorsement or other affiliation with this book. 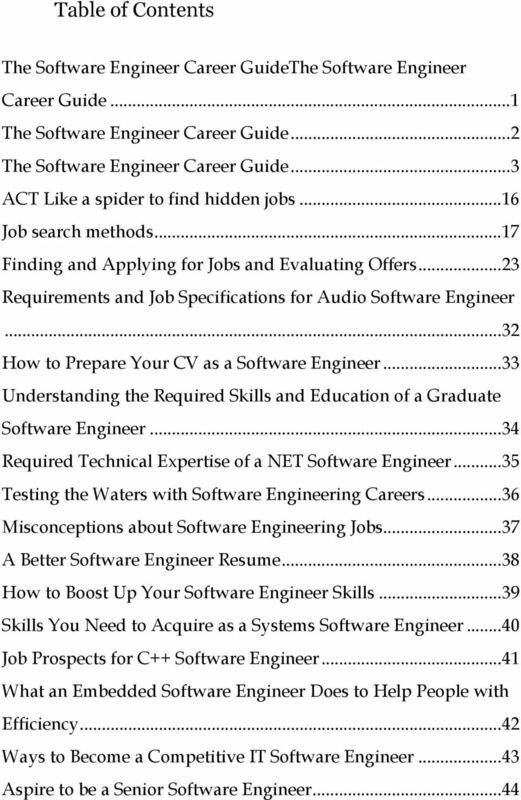 3 The Software Engineer Career Guide This book doesn't load the reader with useful but obvious suggestions ("don't forget to wear a nice suit to your interview," for example). Instead, it deliberately challenges conventional job search wisdom, and in so doing, offers radical but inspired suggestions for success. Think that "companies approach hiring with common sense, logic, and good business acumen and consistency?" Think that "the most qualified candidate gets the job?" Think again! Time and again you'll see that finding a job is a highly subjective business filled with innumerable variables. 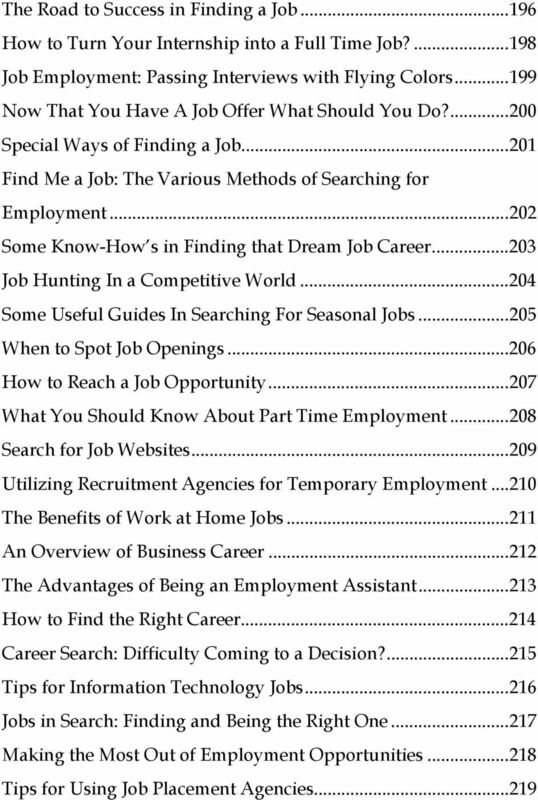 The triumphant jobseeker is the one who not only recognizes these inconsistencies but also uses them to his advantage. Not sure how to do this? Don't worry this book guides the way. 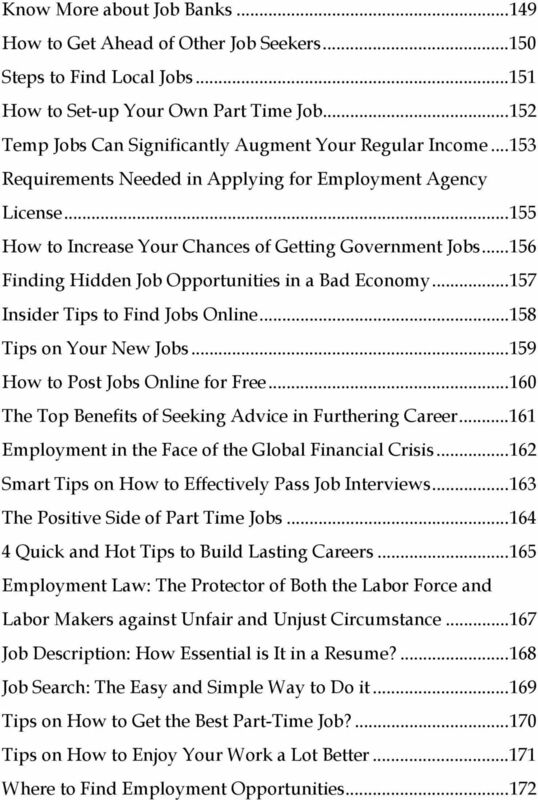 This Career edition has been completely revised and rewritten and is designed to work in conjunction with the latest best practices. This book is not filled with theoretical babble but practical and useful information, knowledge and experience! Packed with time-tested advice, This Career Handbook works as a good companion for those just starting out in the "real world" as well as for those who are thinking seriously about a career change. If you have ever worked in or managed an organization, this book will not only answer a lot of your troubling questions, it will also explain matters that you did not know the questions to just the obnoxious frustration of something that was not working. 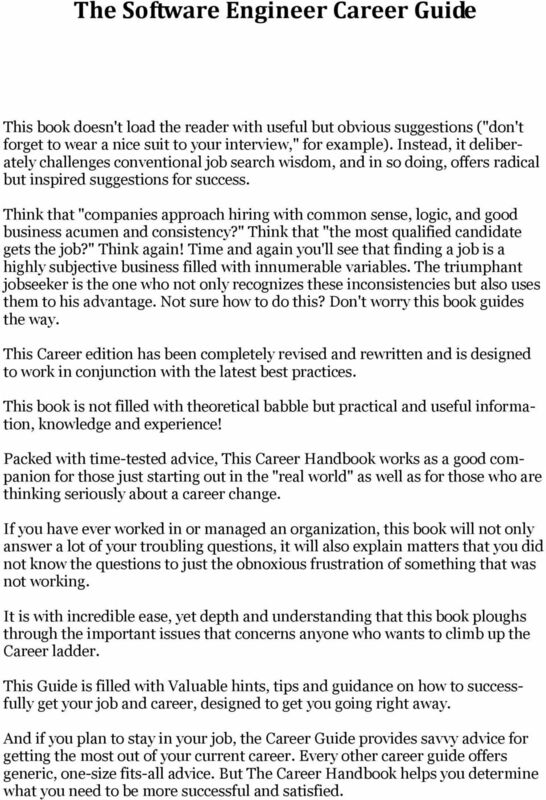 It is with incredible ease, yet depth and understanding that this book ploughs through the important issues that concerns anyone who wants to climb up the Career ladder. This Guide is filled with Valuable hints, tips and guidance on how to successfully get your job and career, designed to get you going right away. And if you plan to stay in your job, the Career Guide provides savvy advice for getting the most out of your current career. 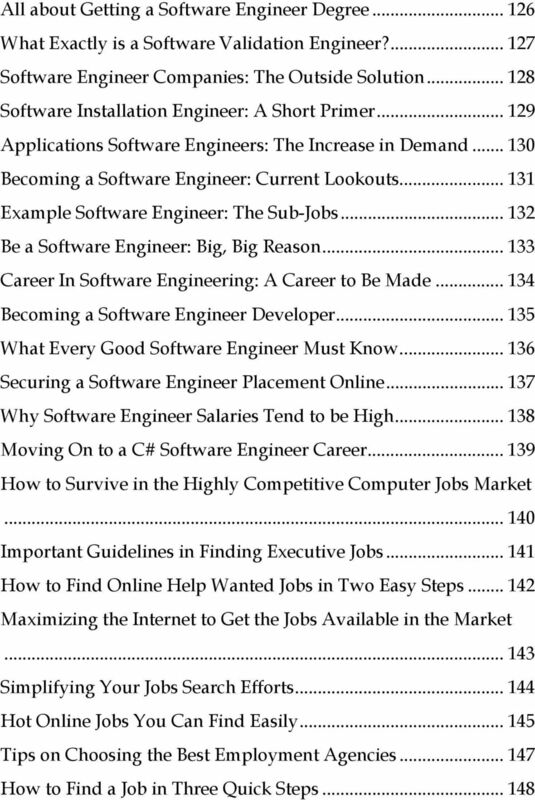 Every other career guide offers generic, one-size fits-all advice. But The Career Handbook helps you determine what you need to be more successful and satisfied. 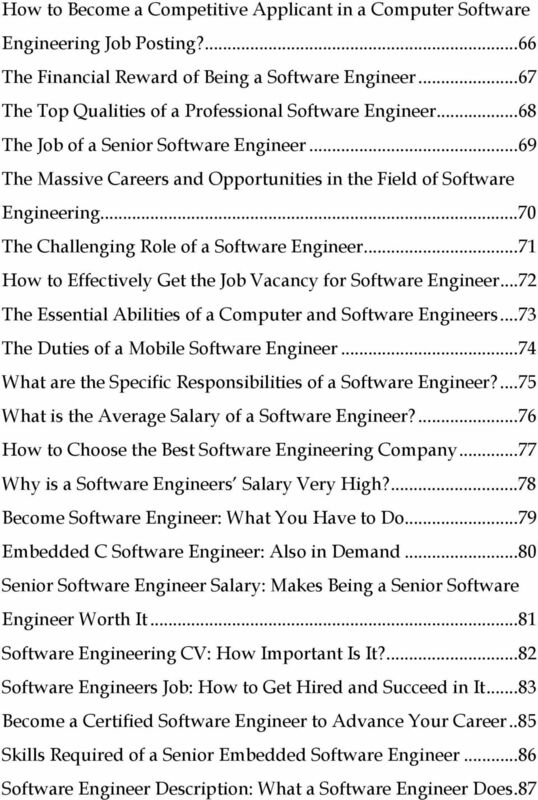 7 Software Engineer Qualifications: Get Them to Get Hired The Advantage of Being a Young Software Engineer The Role of a Chief Software Engineer: Must-to-Know Qualities of Aspirants Jobs for Software Engineers: Securing a Position by Having Advanced Competency Part-Time Software Engineer: Become a Successful Applicant Must Have Qualities of a Scientific Software Engineer Wannabe 93 Software Sales Engineer Job: What Applicants Should Know Embedded Software Engineer Jobs: Opportunities That Should Never Be Missed Become an Exceptional Junior Software Engineer What Is a Programmer or Software Engineer and What Does He Do? 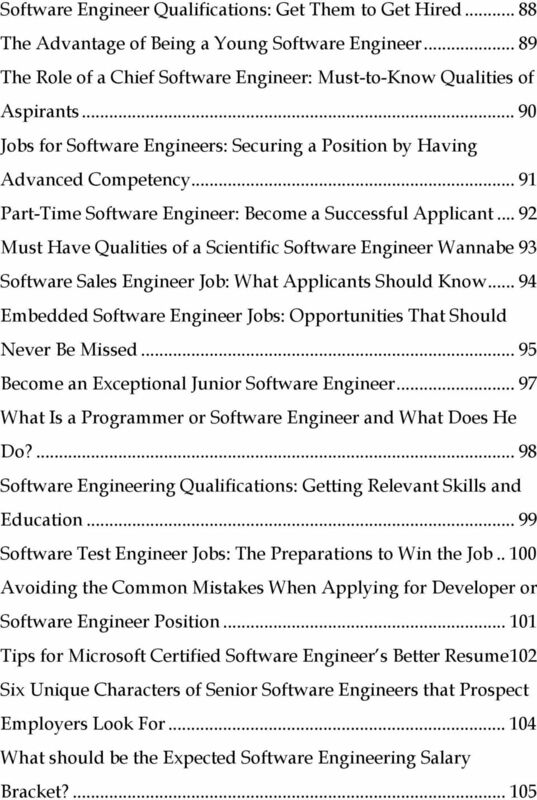 Software Engineering Qualifications: Getting Relevant Skills and Education Software Test Engineer Jobs: The Preparations to Win the Job Avoiding the Common Mistakes When Applying for Developer or Software Engineer Position Tips for Microsoft Certified Software Engineer s Better Resume102 Six Unique Characters of Senior Software Engineers that Prospect Employers Look For What should be the Expected Software Engineering Salary Bracket? 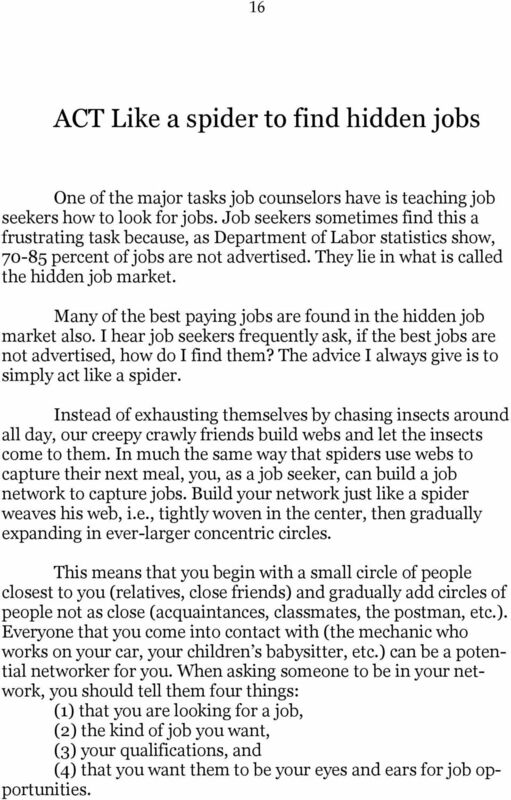 16 16 ACT Like a spider to find hidden jobs One of the major tasks job counselors have is teaching job seekers how to look for jobs. Job seekers sometimes find this a frustrating task because, as Department of Labor statistics show, percent of jobs are not advertised. They lie in what is called the hidden job market. Many of the best paying jobs are found in the hidden job market also. 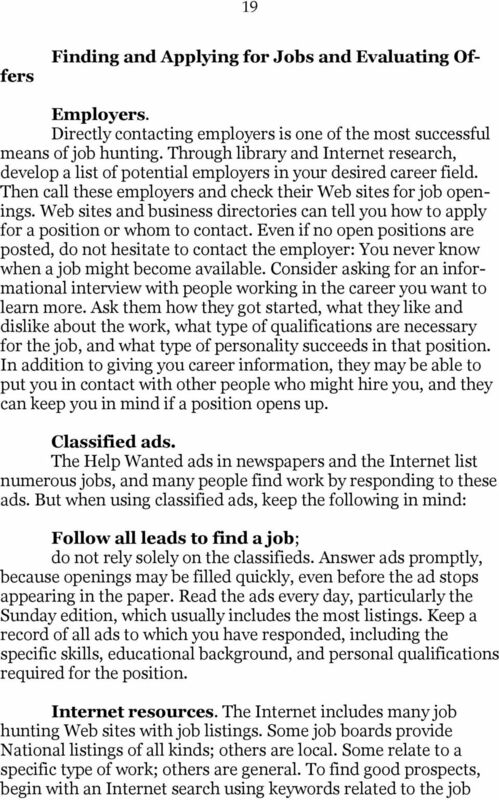 I hear job seekers frequently ask, if the best jobs are not advertised, how do I find them? The advice I always give is to simply act like a spider. Instead of exhausting themselves by chasing insects around all day, our creepy crawly friends build webs and let the insects come to them. 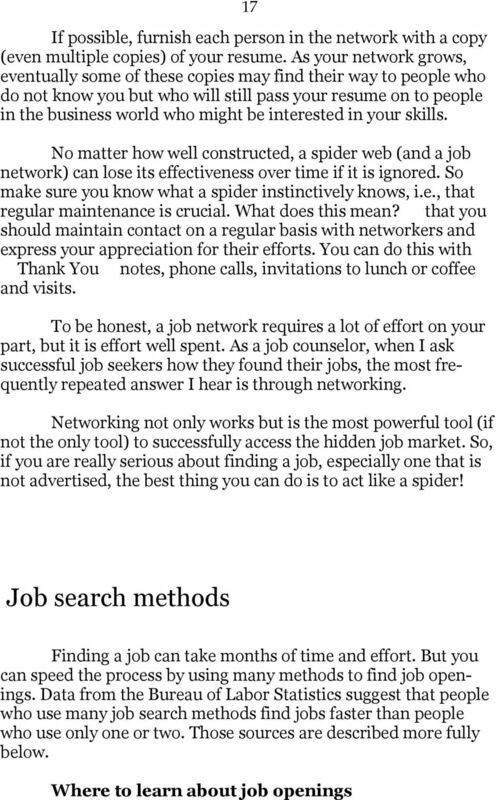 In much the same way that spiders use webs to capture their next meal, you, as a job seeker, can build a job network to capture jobs. Build your network just like a spider weaves his web, i.e., tightly woven in the center, then gradually expanding in ever-larger concentric circles. This means that you begin with a small circle of people closest to you (relatives, close friends) and gradually add circles of people not as close (acquaintances, classmates, the postman, etc.). Everyone that you come into contact with (the mechanic who works on your car, your children s babysitter, etc.) can be a potential networker for you. When asking someone to be in your network, you should tell them four things: (1) that you are looking for a job, (2) the kind of job you want, (3) your qualifications, and (4) that you want them to be your eyes and ears for job opportunities. 18 18 Personal contacts School career planning and placement offices Employers Classified ads National and local newspapers Professional journals Trade magazines Internet resources Professional associations Labor unions State employment service offices Federal Government Community agencies Private employment agencies and career consultants Internships Finding and getting a job you want can be a challenging process, but knowing more about job search methods and application techniques can increase your chances of success. And knowing how to judge the job offers you receive makes it more likely that you will end up with the best possible job. Personal contacts. Many jobs are never advertised. People get them by talking to friends, family, neighbors, acquaintances, teachers, former coworkers, and others who know of an opening. Be sure to tell people that you are looking for a job because the people you know may be some of the most effective resources for your search. To develop new contacts, join student, community, or professional organizations. School career planning and placement offices. High school and college placement offices help their students and alumni find jobs. Some invite recruiters to use their facilities for interviews or career fairs. They also may have lists of open jobs. 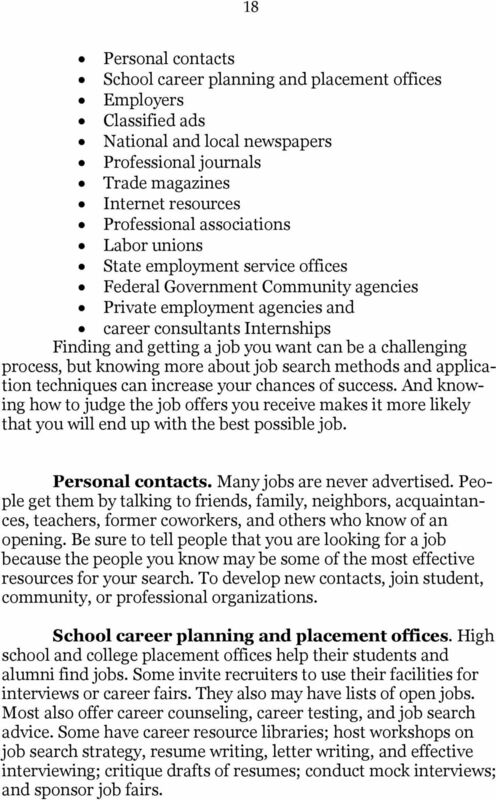 Most also offer career counseling, career testing, and job search advice. Some have career resource libraries; host workshops on job search strategy, resume writing, letter writing, and effective interviewing; critique drafts of resumes; conduct mock interviews; and sponsor job fairs. 20 20 you want. Also look for the sites of related professional associations. Also consider checking Internet forums, also called message boards. These are online discussion groups where anyone may post and read messages. Use forums specific to your profession or to career-related topics to post questions or messages and to read about the job searches or career experiences of other people. In online job databases, remember that job listings may be posted by field or discipline, so begin your search using keywords. 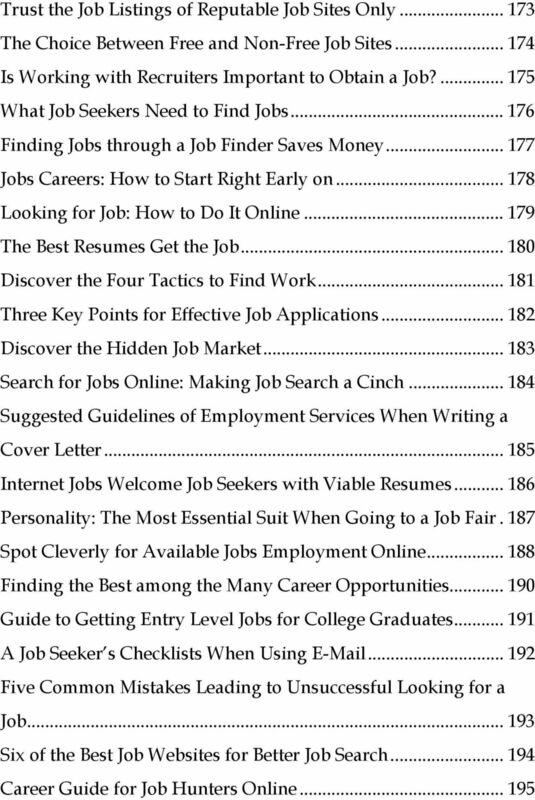 Many Web sites allow job seekers to post their resumes online for free. Professional associations. Many professions have associations that offer employment information, including career planning, educational programs, job listings, and job placement. To use these services, associations usually require that you be a member. Labor unions. Labor unions provide various employment services to members and potential members, including apprentice ship programs that teach a specific trade or skill. Contact the appropriate labor union or State apprenticeship council for more information. State employment service offices. The State employment service, sometimes called the Job Service, operates in coordination with the U.S. Department of Labor s Employment and Training Administration. Local offices, found nationwide, help job seekers to find jobs and help employers to find qualified workers at no cost to either. To find the office nearest you, look in the State government telephone listings under Job Service or Employment. Job matching and referral. At the State employment service office, an interviewer will determine if you are job ready or if you need help from counseling and testing services to assess your occupational aptitudes and interests and to help you choose and prepare for a career. After you are job ready, you may examine available job listings and select openings that interest you. A staff member can then describe the job openings in detail and arrange for interviews with prospective employers. 21 21 Services for special groups. By law, veterans are entitled to priority job placement at State employment service centers. If you are a veteran, a veterans employment representative can inform you of available assistance and help you to deal with problems. State employment service offices also refer people to opportunities available under the Workforce Investment Act (WIA) of Educational and career services and referrals are provided to employers and job seekers, including adults, dislocated workers, and youth. These programs help to prepare people to participate in the States workforce, increase their employment and earnings potential, improve their educational and occupational skills, and reduce their dependency on welfare. Federal Government. Information on obtaining a position with the Federal Government is available from the U.S. Office of Personnel Management (OPM) through USAJOBS, the Federal Governments official employment information system. 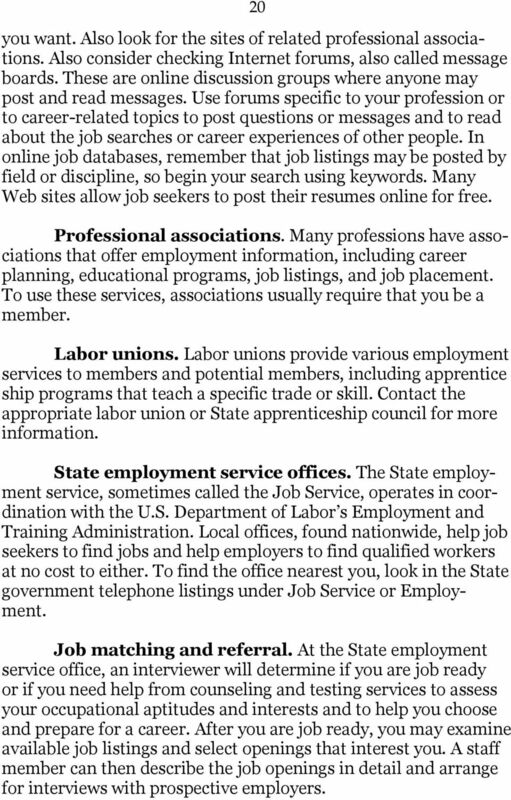 This resource for locating and applying for job opportunities can be accessed through the Internet at or through an interactive voice response telephone system at (703) or TDD (978) These numbers are not toll free, and charges may result. Community agencies. Many nonprofit organizations, including religious institutions and vocational rehabilitation agencies, offer counseling, career development, and job placement services, generally targeted to a particular group, such as women, youths, minorities, ex-offenders, or older workers. Private employment agencies and career consultants. Private agencies can save you time and they will contact employers who otherwise might be difficult to locate. But these agencies may charge for their services. Most operate on a commission basis, charging a percentage of the first-year salary paid to a successful applicant. You or the hiring company will pay the fee. Find out the exact cost and who is responsible for paying associated fees before using the service. When determining if the service is worth the cost, consider any guarantees that the agency offers. 24 24 you increased sales by 10 percent, finished a task in half the usual time, or received three letters of appreciation from customers. Choosing a format. After gathering the information you want to present, the next step is to put it in the proper format. 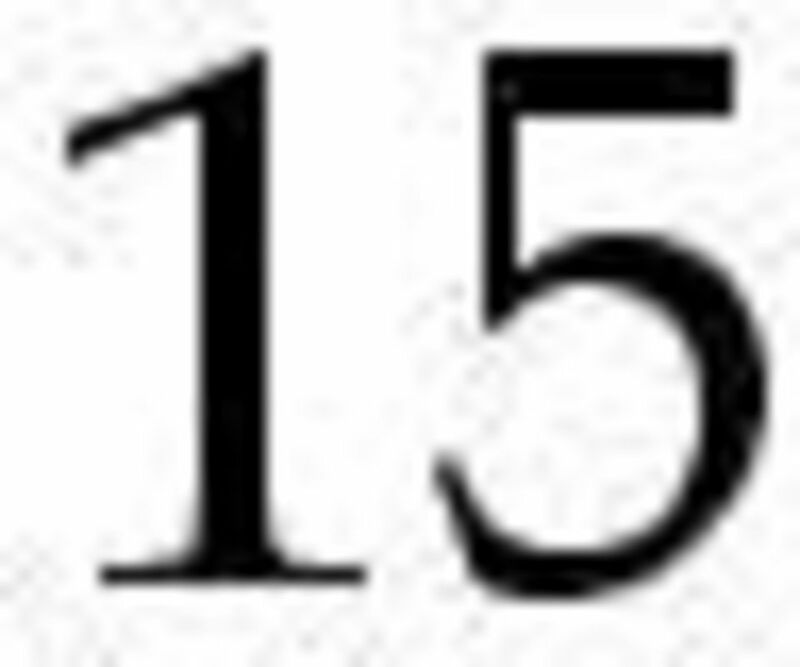 In an application form, the format is set. Just fill in the blanks. But make sure you fill it out completely and follow all instructions. Do not omit any requested information. Consider making a copy of the form before filling it out, in case you make a mistake and have to start over. If possible, have someone else look over the form before submitting it. In a resume, there are many ways of organizing the information you want to include, but the most important information should usually come first. Most applicants list their past jobs in reverse chronological order, describing their most recent employment first and working backward. But some applicants use a functional format, organizing their work experience under headings that describe their major skills. They then include a brief work history section that lists only job titles, employers, and dates of employment. Still other applicants choose a format that combines these two approaches in some way. Choose the style that best showcases your skills and experience. Whatever format you choose, keep your resume short. Many experts recommend that new workers use a one-page resume. Avoid long blocks of text and italicized material. Consider using bullets to highlight duties or key accomplishments. Before submitting your resume, make sure that it is easy to read. 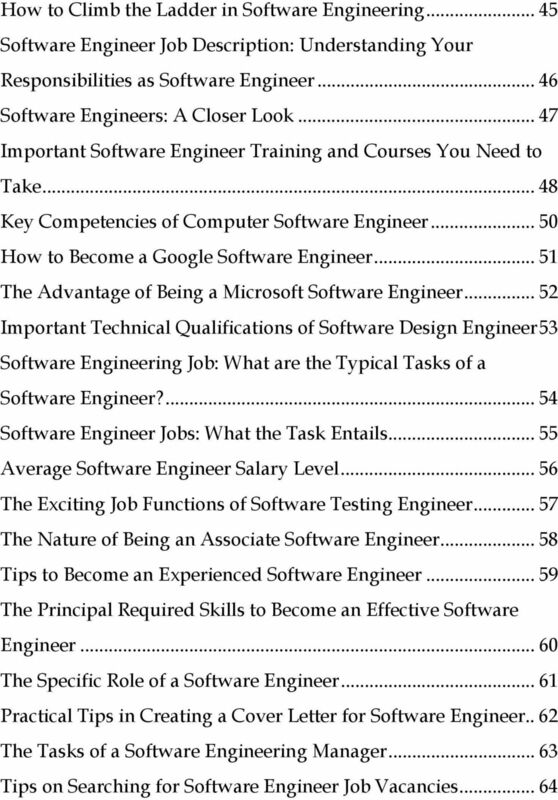 Are the headings clear and consistently formatted with bold or some other style of type? Is the type face large enough? Then, ask at least two people to proofread the resume for spelling and other errors and make sure you use your computer s spell checker. Keep in mind that many employers scan resumes into databases, which they then search for specific keywords or phrases. The keywords are usually nouns referring to experience, education, personal characteristics, or industry buzz words. Identify keywords by reading the job description and qualifications in the job ad; use these same words in your resume. THE JOB SEARCH. What Do I Need to Know Before I Start My Job Search? Resume Mistakes to Avoid By AJE Recruiting Specialist America s Job Exchange The resume is one of the very first things a potential employer will use to decide on the best candidates for an available job. Job seeking. This pack aims to provide you with a few pointers and tips on searching for a job. Click on the headings to jump to that sector. HOW TO FIND A JOB. Are You Ready to Begin a Job Search? Who is considered to be an individual with a disability status? Excerpted from the book Scholarships 101: The Real-World Guide to Getting Cash for College. Copyright 2008 by Kimberly Stezala. All rights reserved. Leave Luck in The Dust high school preparation Freshman year of high school Do your best and if necessary prioritize core classes over electives or activities. Strive for a B or better in all classes. Job Search Strategies Workshop Cal State L.A. Career Development Center Overview of Job Search Process Preparation Perform a self-assessment Prepare tools Conduct an environmental scan /do your research! GUIDE TO DEVELOPING A STRONG SCHOLARSHIP APPLICATION Now That You ve Decided to Apply The aim of this handout is to help you prepare your application for a scholarship now that you have decided to apply. Counseling Center Informational Interviewing INFORMATION INTERVIEWING WHAT IS AN INFORMATIONAL INTERVIEW? Take me through the process.